In 2006 this stunning little fish was discovered outside a small village named Hopong in Myanmar (formerly Burma.) Now known as the Celestial Pearl Danio, it was originally classified as a Rasbora (Galaxy Rasbora – Microrasbora sp. ‘Galaxy’) but is now considered a danio. These fish are tiny and best suited with smaller other small tank mates. They prefer a densley planted tank which replicates their habitat in the wild. Will require a densley planted tank. Add some driftwood plants, perhaps some wisteria or ambullia to help replicate their natural environment. You should consider adding Java Moss, this will be great for when they spawn. Floating plants are suggested and a darker substrate has also been advised. 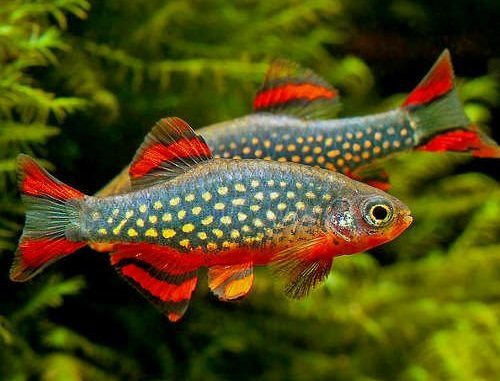 Adult male fish have red abdomen and more bright colouring, alpha males have full colored dark blue body and bright red fins. 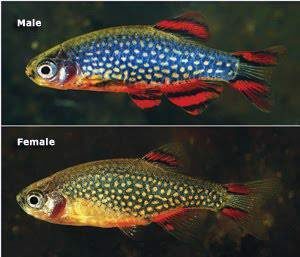 Even the young fish males demonstrate vibrant breed colors when playing with females. Saturation of the fish coloring varies depending on the fish mood and its social rank in a school. Celestial Pearl Danio males are known for nipping at each other in their school or shoal, there appears to be ongoing and constant competition for the alpha male spot within the group. Generally they stay close to their shelters or focus on looking for food. They are known to swim sidewise and incline a bit up or down. When they swim fast to get the food or demonstrate aggression towards a rival male fish, they quickly open their fins and show their superiority. The fish is active and friendly, though a very fearful one. So, you mustn’t keep it with large and aggressive fishes, however the fish gets on well with shrimps and it is perfect for thickly planted small tanks.